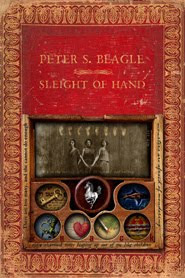 Though the work of Peter S. Beagle has been widely awarded and celebrated, it’s possible you don’t know his name. Even if that is the case, however, you probably do know his work. Beagle was both the a uthor and the writer of the screenplay for The Last Unicorn, made into a much-loved animated film in 1982, starring Jeff Bridges, Mia Farrow and Angela Lansbury. The book, first published in 1968, remains the author’s best known work. Beagle also wrote the screenplay for Ralph Bakshi’s animated version of Lord of the Rings as well as episodes of Star Trek: TNG and other television shows. Though writing for film and television detoured what had been a successful career as a novelist in the 1980s, by the late 1990s, Beagle was back to books and his literary work has been published regularly ever since. Hollywood’s loss is our gain because Beagle’s literary voice is unforgettable; his talent formidable and even his short stories often leave an indelible mark. Take his new collection, Sleight of Hand (Tachyon). In 13 stories, Beagle seems to explore the very boundaries of his chosen corner of the genre. Beagle’s stories are touchingly moral and, despite the fantasy settings, they deal with issues of import to many of us.